The occupant of this grave moved to Llandudno to get away from the risk of bombing in the First World War, only to be killed by enemy action at sea. Civilians in Britain were directly threatened by war for the first time in many generations after the fighting on the Western Front had reached deadlock. In response, in 1915 the German armed forces decided to use their Zeppelin airships to bomb towns and cities in Britain. Henry and Mary Ann Johnson moved to Llandudno in spring 1917 from Hythe, in Kent, to escape the danger of those air raids. 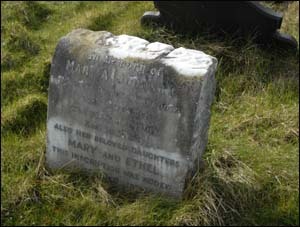 Mary Ann visited her daughter in Ireland in September 1918. On the morning of 10 October, she boarded the mail ship RMS Leinster in Kingstown (now Dun Laoghaire) to return to Wales. Shortly after 10am, a German submarine fired two torpedoes which blew a huge hole in the ship’s side, causing it to list and sink. Lifeboats were launched and some 200 people were saved. However, more than 500 people drowned, including Mary Ann. Meanwhile, at Llandudno Junction railway station Henry Johnson waited in vain for his wife to arrive by train. On enquiring about the delay, he was told that the ship had been sunk. Two days later he learnt, from his daughter, that Mary Ann was not one of the survivors and that her body had been recovered and taken to Dublin. Parts from RMS Leinster are displayed outside Holyhead Maritime Museum as part of a memorial to people lost at sea during the war.